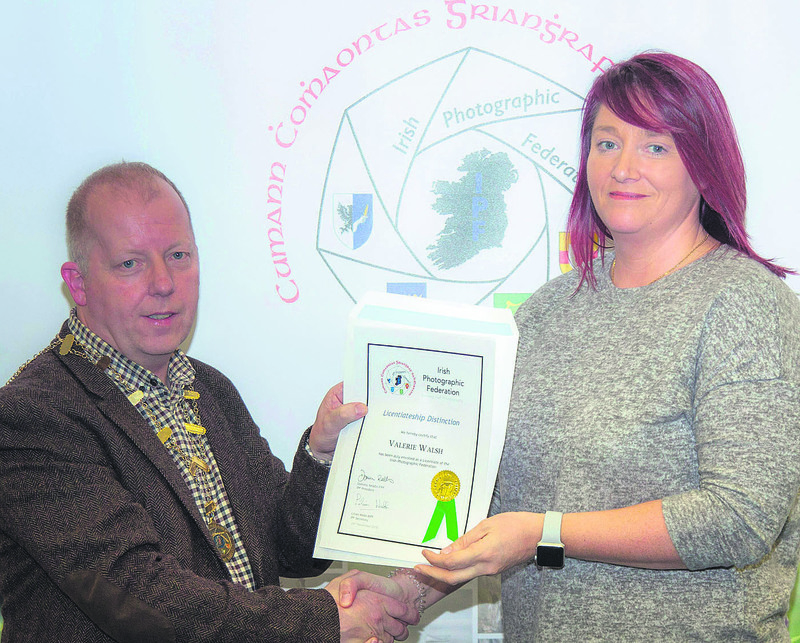 Congratulations to Valerie Walsh of Blackwater Photographic who received her Licentiateship Distinction from the Irish Photographic Federation. Blackwater Photographic Society members Paul Madigan, Kieran O’Mahony and Pakie Donoghue had fantastic results in the regional rounds of the SACC Photographer of the Year. In the advanced section of the Colour Print Category, Kieran scored two honourable mentions, and also got an honourable mention in the Projected Advanced Category. In the Non-Advanced Colour Print section, Paul Madigan scored an honourable mention, while in the Mono Print he deservedly brought home a gold medal. However, Paul was not finished at that, as in the Mono Print Themed Category he managed to grab first and second, winning himself a gold and silver medal. In the Nature Photographer of the Year which was held in the Cabragh Wetlands recently, Kieran O’Mahony had another great day, scoring a silver medal and an honourable mention in the Colour Print section. Pakie O’Donoghue was also given an honourable mention in the same category. Kieran went on to grab another silver medal in the Advanced Projected Themed section. Paul Madigan had another great day out in Cabragh. In the Non Advanced Colour Print Category, he was awarded an honourable mention, while in the Non-Advanced Projected Themed Irish Wild Birds, he secured a gold medal for his efforts, so a hearty well done all round. Unfortunately, we are unable at the moment to show any of their winning images as they go forward to the national finals in Carlow later on in April, and we expect some more awards from these worthy photographers. Congratulations to Blackwater Photographic Society member Kieran O’Mahony who won the gold medal recently at the Inter-Regional Wildlife Competition in Dublin. Kieran’s image of a kestrel in flight was taken in Portugal last year. 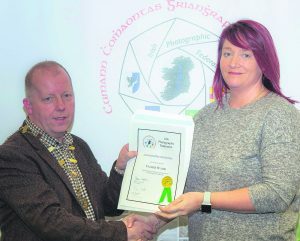 The competition, which had over 400 entries from wildlife photographers from across Ireland, was run by the Irish Photo-graphic Federation Nature Group (IPF) and the Northern Ireland Photographic Association (NIPA), and was held at the Botanical Gardens in Glasnevin, Dublin. This was the first year of the competition and next year it will be hosted by the Northern Ireland Photo-graphy Association. Blackwater Photographic Society would also like to congratulate club member Valerie Walsh on receiving her LIPF for a fantastic panel of images. Kieran O’Mahony and John Flynn won awards at this year’s Cork Inter-national Salon of Photography recently. Kieran received a PSA silver medal for his image of a fox with a rabbit in the nature section, and John Flynn received a FIAP ribbon in the Landscape section for his shot of Buachaille Etive Mor in the Scottish highlands. This year, the Cork Salon of Photography had almost 4,500 entries from photographers from all over the world. Well done, lads!